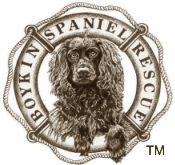 Piper's Success Story - Boykin Spaniel Rescue, Inc.
Piper came into BSR care when her owner found herself working more than what was fair to Piper, and had to leave her caged for many hours a day. Because of this Piper had housebreaking issues and gulping down her food and water. In the beginning of her foster care, she had to be taken out to go potty every two hours so that she would get used to going and not try to hold it as long as she had previously done. She did not have other issues, she was a loving happy dog who loved to snuggle. Piper is doing terrific. Her time with her foster mom clearly prepared her well for her forever home. We are thrilled with her and we think she is very happy. She is very sweet and likes everyone she meets, including children and other dogs. 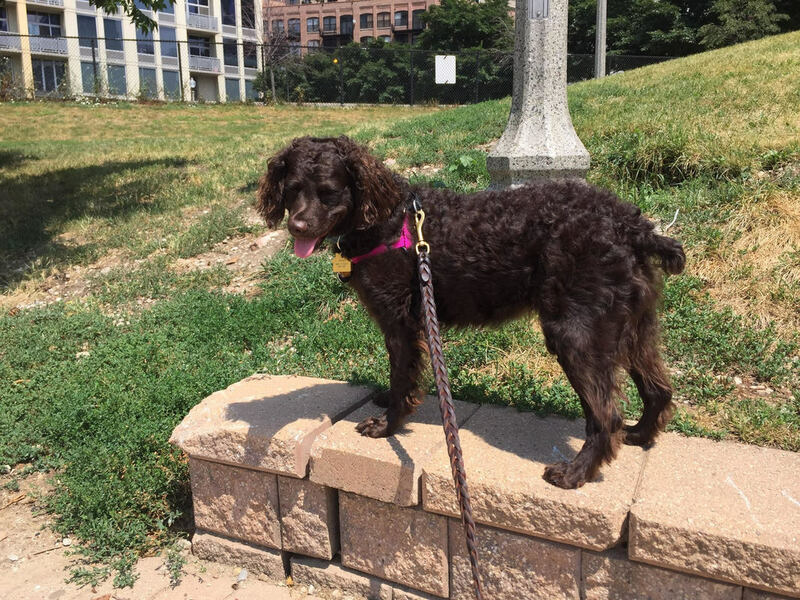 In Chicago, we spend a lot of time in the dog park where she has made several dog pals. She loves her sister, a seven year old, 7 pound, toy poodle rescue named Maisey. They wrestle and play all day long. At first we were a little worried about rough play because Maisey is so much smaller, but Maisey clearly likes it and holds her own. Our daughter has a big red bone coonhound and Piper wrestles with her too, though in this case Piper is the small one. We go on a lot of long walks. In Chicago we walk through the neighborhoods and when we are in Wisconsin, we hike on forest trails. She loves these walks and has a lot of stamina, as long as it is not too hot. We are not ready to walk off her the leash, though we are practicing, using a long lead. Piper is a good eater, and will occasionally check out the counter to see if she can find a special treat. She has gained a couple of pounds and is now is about 22lbs which seems ok, but we are being careful about not over-feeding her. She is not fearful of vacuums, sirens, or other loud noises. Bicycles, strollers, wheelchairs etc. do not bother her. We have had few problems with destructive chewing, though. She does love to shred paper napkins, tissues and toilet paper if she gets access to them. She occasionally thinks it is fun to pull toilet paper off the roll so we are getting pretty good at keeping the bathroom doors shut. We have taken her on the boat, and she did fine, but we don’t think she loved it. Also took her swimming in the lake (with a life preserver) while on the boat and got the same reaction - ok but not thrilled with it. We are going to expose her to water with a small baby pool and see if we can get her more interested in water. House training has gone well, with only a handful of accidents. If she is giving us a sign she has to go, we have not yet figured out what it is. We make a practice of going out every couple of hours and as long as we do this, there are no problems. She has no difficulty being in the crate for 3 to 4 hours with no accidents. In the dog park she goes right away, but on our walks, she is very particular about where and when she goes. We have started formal training. She is very good at sit, stay, down, crate and pretty good at come. Beginning to work on place and she seems to get it. Have not made much progress on leave it and drop it. Getting a little better at not jumping on people she is excited to meet, but we need to make more progress here. Her favorite toys are elk antlers and rubber chew toys. Once in a while we give her a soft toy but she is inclined to rip them up. She plays tug of war with Maisey using a rope toy but is still learning not to try to steal toys from Maisey. Probably the biggest challenge has been car rides, though this is getting better. In the first couple of weeks, she threw up three times but not since then. We are careful to have someone hold her with a towel on their lap. She tends to drool a lot in the car and if you don’t wipe her mouth with a towel she will shake her head and everyone in range gets slimed. We did try a prescription the Vet gave us though not sure this helps the drooling. At any rate, it seems like it is getting better and the vet thinks she will outgrow it.